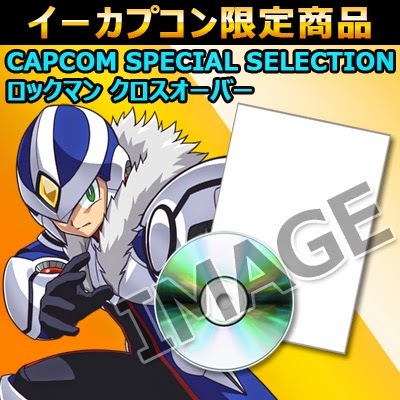 Later this fall, the original Rockman EXE and Rockman Xover are getting the "Capcom Special Selection" treatment. These are official 32-page art books bundled with mini soundtracks, going for 1,852 Yen a piece. As one may recall, Rockman DASH 2 received a similar package in 2009. The e-Capcom description for the Rockman EXE set suggests new and never-before-seen concept art appearing in the art book. The CD will contain select tracks from EXE1 and an arranged version of "Theme of EXE" from Operate Shooting Star. 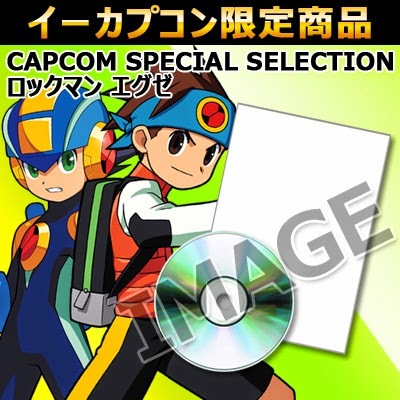 Meanwhile, the Xover set contains artwork for content not currently available to players, such as OVER-10 and Giallo. Music-wise, it's pretty much everything from the game. This is the first time Xover's soundtrack has been publicly released. Both sets are due September 25th, exclusively through e-Capcom. Thanks to MidniteW for the heads up. Good stuff but I can't understand why Mega Man is good enough to get merchandise like crazy but not good enough to get a game, not even a low budget game like MM9 and MM10. Based on how much Comcept asked for Mighty No. 9, Mega Man 9 and 10 could have cost 100k each or more. That's only relatively low budget. I don't know about that. Might No. 9 is creating everything from the ground up. Mega Man 9 and 10 already have a lot of assets created as well as an engine and all that. They could probably slap something together fairly cheaply. Mighty No. 9 is also going for something a bit more graphically advanced, will supposedly have more features than pretty much any Classic Mega Man game, and a few other factors. Hence them asking for nine times that. Shovel Knight asked for 75k and that's also an 8-bit style game, and coming from an indie company. Games are expensive when you do everything properly to make them. If the next Mega Man game has as much content as Shovel Knight I will accept the idea that it could cost about 100k (even though Capcom isn't indie and once again still has assets they recycle). Until then I will skeptically acknowledge the possibility, but won't acknowledge that it's necessarily required. According to Tim Schafer, just to patch a console game costs 40,000 dollars. Just to patch. That little annoying update screen when you boot a game, that kicks you off the internet until you hit accept and let it download. 40 thousand. A game costing 100 thousand really shouldn't be unheard of, even if it's 8-bit style. Capcom often recycles their content, and also use a previous game as base for other. For example, there are leftover graphics from Mega Man 9 in MM10, Mega Man Legends in The Misadventures of Tron Bonne, and TMoTB in MML2. I looked up the article you took that information from. It sounds like Schafer was referring to a patch on the 360 or ps3. There are other articles talking about how that is a requirement from Microsoft. It only costs that much if the companies that own the system you are patching your game on want it to cost that much. I believe that's one reason why Schafer went on to praise Steam. That said, I don't think a game costing 100,000 is "unheard of" per se. I just think at this point in time with the resources available Capcom should be able to make a Mega Man game of the Classic style for fairly cheap regardless of context. I would also like to point out that Sakurai went to Capcom, they didn't go to him. Sakurai asked Capcom to use Mega Man in Smash because he was so highly requested by the fans, second only to Sonic in terms of third party characters. As for profit, well, Capcom claimed to be happy with sales of Mega Man 9 and 10 (though admittedly more modestly so of 10's than 9's.) I can't imagine they would be happy with something that didn't earn them a profit, so I don't see how there's any evidence suggesting a new game wouldn't net them a profit as well. A quick addition to drive my point about it being up to the console creators. Microsoft does allow companies to patch their games once for free. It's completely their call. If I recall correctly Sakurai approached Capcom first to add MM in Smash. Capcom just accepted and cooperated. I could remember things wrong though, would like a correction source in that case. You have to wonder what kind of promotional codes for battle memories they'll have for the Xover. Assuming they'll be doing something like that for both books. I'd definitely like to see what the tracklisting is for both of these releases. Why oh why arrange Theme of EXE again? How many time Capcom, how many times? Does Capcom do anything properly creative and well-versed to customers anymore? You can also ask yourself why does Capcom keep remixing Dr. Wily Stage theme from Mega Man 2 so many times? It's probably because it's a fan favorite and/or it's a good song? While the game itself is bad, Xover does have some pretty nice art (minus certain one's...) and a nice soundtrack, so the book isn't an entirely bad thing. I'm more interested in the EXE one though. There's also a Breath of Fire soundtrack selection+artbook being released alongside the two Megaman ones that looks pretty snazzy.